After 18 hours at sea, Friday, September 13 Ado landed in Bari Just put our foot on Italian soil motocilcista went hunting for a good cup of coffee ... just as we do in our country! And then of course he tasted again with pleasure the Italian cuisine! The following day he made ​​a quick trip to Taormina in Sicily, and was immediately directed to savor in a pastry cannoli, ice cream and oranges. On his blog he wrote: "As I said some time ago, 'God gave the secrets of the Italian kitchen and told him to distribute it at all. But of course the Italians were held all the secrets. 'This thing is appreciated in full, only to be some time away from Italy." Sunday, September 8th was the 100th day trip to Maglajlic Adnan, who last weekend visited Macedonia, Kosovo, Montenegro and Albania, covering about 2,500 km. Tuesday, 10 arrived in Greece and visited Athens, he writes on his blog: "I had read some time ago on a forum that if Athens is expected to see the Rome of the Greeks, we have it all wrong, and in fact is to I made it myself. As for getting around the city in motion, in general I noticed that the lady here are the bikes, are many, but being that about 50% of the Greek population lives in Athens, the traffic is scary. " After Bosnia, last Thursday Ado arrived in Romania , specifically in Sibiu. In this part of the trip, our rider has found the company of two boys Reggio Emilia known a little ' by chance in the middle of traffic . With his two new friends, the next day, in the rain, Ado has traveled the " transfagarasan " road , he tells us , " has become famous since the known transmission Top Gear has defined it as the road more beautiful in the world ( previously it had been told of the " Passo dello Stelvio " ) . My conclusion is that the curves are magnificent , the road is quite long, but the asphalt is really bad. In some places you can even finish the rubber , but many have to be careful , gravel and asphalt corrugated are everywhere. " The next day Ado is left for Turkey, when they face a queue of about 15 km to cross the border . From good motorcyclist has surpassed all the cars in the queue and it arrived just a few meters from the border , where the practice is to switch over about an hour. Once you leave Bulgaria, Ado was able to try on his two-wheeler in the streets of Turkey perfect until the nth stage of his journey to Istanbul. The next objective after a visit to the Turkish capital was to visit the Republic of Cyprus .. Ado unfortunately did not have permission or by the Italian Ministry of Foreign Affairs or by the Italian Consulate in Istanbul. For those who want to know the grounds on Wikipedia or on the website of the Ministry of Foreign Affairs is the official document in which the Italian State urges people not to reach the Republic of Cyprus via Turkey . 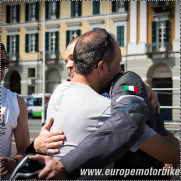 If you follow the journey usually by Ado on the site www.europemotorbiketour.it you have wondered: what happened to our biker? The days spent in Gracanica in Bosnia, his native city, have been very intense .. and now, after ten days of silence, Ado is back to writing on his blog! "Being not coming around here for about 3 years, I have visited all the relatives, friends, cemeteries, etc etc etc. In addition to the things that are purely personal, I was interviewed by the blog Bosnian No. 1 and unfortunately I was not able to participate in the television program of the Bosnian state television, again for lack of time. All this media interest is the fact that just do not happen every day that one born in these parts do an adventure like mine. " "In my opinion in Bosnia is not to enjoy the road (as it would be in Austria). The streets do not have big holes or anything, but are full of oil stains, caused by some older machines, so extreme caution to slow down and even to bend (I happened to hear in round from the back). So why a motorcyclist should come here? Well, the food is fantastic and there are several things to see. " 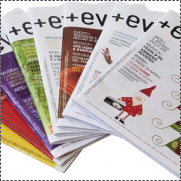 Waiting for more posts and photos that Ado has taken the past few days, we point out that the number of + events of September, on newsstands for a few days, we have dedicated a page the Europe Motorbike Tour with some considerations on the journey of the protagonist himself and information about his return in Cuneo, scheduled for late September. "After less than 2 hours of driving, I understand why the appellation" motorcyclist's paradise. "The track is perfect, the curves even more and especially road safety education of road users, motorists and motorcyclists, is exceptional. Nobody invades the lane and no one cuts the curves. " There are many aspects of Austria who hit him, certainly he would have liked to spend a few more days, but the Europe Motorbike Tour must go on! So Sunday, 18 is broken down by Slovenia and more precisely for its capital, Ljubljana. The next day he wandered Ado Slovenia and reached a new entry of the European Union: Croatia. After a visit to Zagreb, the Croatian capital, our rider is left for Gracanica, his hometown. "The details of my hometown and I'll give you all of Bosnia in the coming days, I'm going to stay here for a few days and discover all the beauties which until now I had never taken the time." Also this Friday, here we geographic map in hand (or perhaps I should say to the mouse pointer) in pursuit of virtual Adnan Maglajlic traveling aboard his Triumph up and down Europe. A week ago Ado arrived at the town of Warsaw, from where it is distributed at a time here in the Czech Republic was waiting for the 17th stage of his journey to Prague. A quick visit and then off to Bratislava, capital of Slovakia. "In the ranking of the capitals visited until now," he wrote in his blog Ado "Bratislava is definitely the most peaceful place in the city. 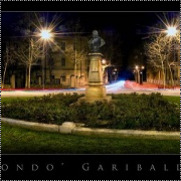 Both day and night, in the historic center or out, the city is always very quiet. Almost does not seem a capital. " The next stop was Budapest, capital of Hungary, then off to Austria, a paradise for bikers! If you want to be always up to date on his travels, visit www.europemotorbiketour.com: Ado daily updates his blog with comments and photos! 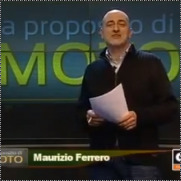 In addition, every Friday you can find the summary of the week here on the blog of + events. The next day, after a brief visit to the city, our two adventurous riders boarded the ferry to Tallinn, capital of Estonia, and then say goodbye: Dawid headed toward home, in Poland, while Ado was granted a visit to the city. "Tallinn is different from other capitals seen so far. The town is very small, especially the historic center of the city, with its non-circular motor transport. But I firmly believe it is not appropriate to use the bike in this capital, everything you visit on foot. I must say that I like it. " Leaving the capital of Estonia, Ado has traveled around the country before reaching the capital of Latvia: Riga Latvia Ado In the small state has found bad roads, sometimes unpaved and all without rest areas "The first km in the capital Riga have suffered a Soviet-style city, but in the center changes. Honestly, after the first few kilometers I realized why on the internet I have not found many tales of adventures in these parts. " The next day our biker, after wandering for Lithuania, has reached its capital, Vilnius. Wednesday 7 instead arrived in Warsaw, Poland, where he received hospitality from the family members of a group of boys known in Norway. The name of their association Break is the limit. Another group of young adventurers around the world! Their main goal is to break the routine and daily patterns and visit the most interesting places in the world. On their website they write www.breakthelimits.pl (in Polish .. and we report the translation): "It is seeing the beauty and power of nature we can see the beauty of life." And again: "We have a lot of experience in 'organization of such events, never before have we undertaken a similar task. We are aware of our limitations .. do not know, however, what are the opportunities that we have. But we decided 'let's do it!' "
Among travelers with the intent to push your limits and break free from everyday life you will .. and help each other! Yesterday Ado will be able to visit Warsaw? And today will be going where? 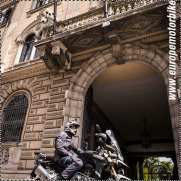 If you want to be always up to date on his travels, visit www.europemotorbiketour.com: Ado daily updates his blog with comments and photos! In addition, every Friday you can find the summary of the week here on the blog of + events! It's been two months from the start of the Europe Cuneo Motorbike Tour and now Norway and its spectacular fjords are in first place among the places that have captivated our biker Adnan Maglajlic: "Reluctantly I must admit that I had the primacy reserved table in Ireland, is about to be beaten by Norway. Turn the fjords is an experience that really is not for the faint of heart. Because sometimes just behind a curve is a wonderful spectacle of nature. If in Ireland needed two weeks to see well, here a month would not be enough. " Yes, the clock is ticking and it is never enough when there are so many wonderful things to see .. so last Saturday Ado has looked at the calendar and .... he realized that if he did not want to miss one of the shows so unique that offers Norway, North Cape had to be within three days. For the uninitiated, the North Cape is a cliff that is located on the northern tip of the island of Magerøya, in the northernmost part of Norway. A typical cliff overlooking the sea and Arctic which is located just over 500 kilometers beyond the Arctic Circle. Here only in a certain time of the year you can see the phenomenon of the midnight sun. What's this? As we approach the summer solstice, in the regions above the polar circles the sun never sets below the horizon for at least 24 hours and therefore never falls the night. "Having had the honor and pleasure to be able to greet the latter midnight sun was really exciting. They had arrived a 4 cruise ships to assist its passengers in this show. The license plates of motorcycles and cars came from all the countries of Europe. The sky above us was a grossisima fireball, everything was a deep red. 01:00 I decided it was time to leave this magical place, and as I walked away every now and then I turned back to see one last time that spell. " The morning is broken down to the times of Finland and met a boy of twenty-two Polish origin who was going through all of Scandinavia solo and he is now continuing his journey in the company of Ado. 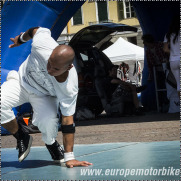 You can follow Ado every day on the site www.europemotorbiketour.com. Or you can continue to read us always here, Blog + events: every Friday you will find a brief summary of the week-long trip! Last weekend Ado visited the two capitals respectively of Denmark and Sweden: Copenhagen and Stockholm. Our biker seems to have been particularly fascinated by the Swedish capital, which describes it as "The first impression of Stockholm was" ancient ". The old town is perfectly maintained and American cars are all the rage 70 years. In the evening the sky over Stockholm is crazy, as well as the clouds change shape every 5 minutes, change the color. I believe that during an evening, the same landscape could be photographed several times, and each time it seems another place. " Sunday, 21 July, 51 th day of travel: Ado has left behind the sky of Stockholm and headed to Oslo, Norway. The reason is explained to him directly in one of his posts: "I could have jump Oslo, since the goal of my adventure is a visit of 27, 28 capitals pardon that make up the EU (we remind the reader that from 1 July joined the Union Eropea also Croatia and Ado is planning a visit to its capital, Zagreb. Ed.) But since I wanted to do the fjords from the beginning, I did not have to miss a jump in Oslo. " The "jump" lasted all of three days, in which Ado has planned the next move and visited the city on his motorcycle. 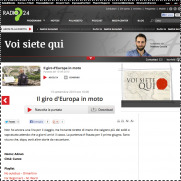 Wednesday, 24 July, 54 th day of the trip: the day started with an interview on the radio Sole 24 Ore for the program The other Europe led by Federico Taddia and continued aboard his Triumph, to new beautiful landscapes, in land of the fjords. Thursday, 25 our Ado, from Cuneo party with the intention of not paying no visit for budget reasons, made an exception allowing himself to spend 100 crowns to reach Dalsnibba, "a mountain of 1500 meters that has a totally vertical , where you see the town of Geiranger. Entertainment true. "Dalsnibba is worth 100 crowns, one might say! Stimulated by email from a reader, Ado has also revealed that in large cities almost always sleeping in youth hostels, while when it is in the midst of nature his refuge is represented by a curtain Ferrino. Exactly a week ago, Friday, July 12, Ado arrived in Delfzijl, a small Dutch town on the border with Germany, where his uncles were waiting for him. The next day back in the saddle to a major new destination, the 9th capital so far achieved by our biker: Berlin, one of the most important political, cultural, scientific, and media trade fair in Europe. Here he met two Turkish boys who meet again soon in Istanbul and met the American artist Drury, known during his stay in Dublin, a few weeks before. There are many people that Ado is meeting during his trip, and all in some way are leaving something, even just a suggestion. In one of his posts published on www.europemotorbiketour.com Ado wrote: "I confess that traveling is nice, drive and see beautiful landscapes leaves me a lot of emotions. But what makes the difference certainly is the people. The emotion of a sunset at some point vanishes, but the memory of a person stays longer met, and especially the person you can meet again. " One of the most interesting characters Ado until now has known is Shin Kore, remember him? The Japanese rider met by chance in Lisbon that for more than three years has been touring the world on his bike. Just a few days in Ado who was in Berlin, the Shin Kore updated on her journey after a jump in Italy (with a shift to Cuneo), reached Slovenia and Bosnia has been hosted by the parents for a few days Ado. Solidarity among travelers! But back to Ado: after a short stay in the German capital, rose riding his Triumph and headed north, to Denmark. Here is the 10th leg of the tour, another magnificent capital that can not wait to be seen at the edge of a two-wheeler: Copenhagen. It is here that we leave today, waiting for new posts, new photos, new encounters. 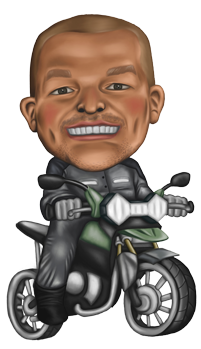 You can follow Ado every day on the site www.europemotorbiketour.com. 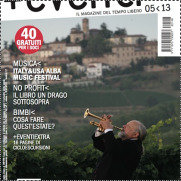 Or continue reading the blog of + events every Friday! "The first few miles were beautiful, because I finally started to live up to what a few days ago still dreaming with open eyes." It 's been just over a month since Adnan "Ado" Maglajlic, twenty-five Cuneo was born in Bosnia, wrote these words in his diary. The initial idea of ​​moving along 1,200 km to his native country has become a journey of 25,000 km to the discovery of the 27 EU capitals. 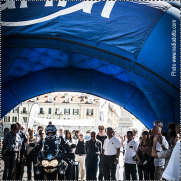 Thanks to his perseverance and determination, "Ado" has obtained the official partership Triumph Italy, the patronage of the Municipality of Cuneo, FIDAS and sponsorship of numerous companies, each a leader in its field. "It 's served a lot of willpower - tells Ado - not to give up in the face of hundreds of waste that I received, but I never stopped believing in my dream. The only person who had confidence in my project from the beginning was Nadia Dotta www.nadiadotta.com, which is entirely occupied the graphics and design for my website www.europemotorbiketour.com . It was not easy - he concludes Adnan Maglajlic - but I was lucky enough to meet so many right people with whom to share the project. " 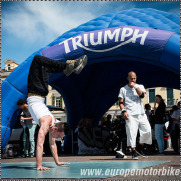 And now traveling on his ship Triumph Tiger Explorer XC; Party from the central Piazza Galimberti in Cuneo June 1, is currently in Germany, after having walked the roads of France, Spain, Portugal, Ireland, United Kingdom, Luxembourg, Belgium and the Netherlands. He has already visited the first eight European capitals included in its way, Lisbon, Madrid, Dublin, London, Paris, Luxembourg, Brussels, Amsterdam and Berlin with the intention of seeing all our other period of four months, returning to Cuneo by September. "I would like to find out what unites and what divides the inhabitants of the European Union - said Ado Maglajlic - who are the people who live in Europe, a people so different habits and customs, but united by a continent, the Old Continent and the new Europe. " His journey is dotted with encounters, faces, stories and so many indelible images. The green hills of France and the dry earth along the Camino de Santiago. The scents of Portuguese cuisine and rain legendary Ireland. The festive welcome and hospitality of the Triumph dealer. The 4 seasons in one day in Scotland and the chaotic traffic of London and Paris. The luxury and green of Luxembourg, the small villages of Belgium, flowers and colors on the way to Amsterdam. And many characters, new friends with whom to share part of the route. As the Japanese boy met and known in Lisbon with his Suzuki "very experienced" is touring the world for over three years and chose a bike with 250cc because "it's hard to broken, it's easy to fix! "(" it's hard to break, easy to fix "). Or the martial arts world champion Jose Cardalda who knew of his passing in Spain has contacted through facebook, to offer him a place to sleep and a meal topped with a very slow Italian and a Spaniard reduced to the minimum necessary, special ingredients for a chat lovable full of passions, family and work. Or Triok and his wife, French sparkling old couple, lovers of Triumph so you will have a head; know via the forum triumphchepassione.com arrival of Ado from their sides decided to invite him to home and to accompany him for a stretch of road, dispensing warmth and affection from the first moment: "They are the perfect pair of classic films, happy and united, that on Friday evening said the other:" The weekend people go to the beach, so the streets are free to go in motion. " If there was a competition of the most beautiful couples in the world for each motorcycle brand, Triumph definitely recommend the two of them! " In Ireland baptism of driving on the left was celebrated with decent showers , porous asphalt, uneven and full of gravel roads however, have not scratched the magic of the place: "WOW, how beautiful Ireland! How many pictures I can do, I can never convey what really my eyes see. " The challenge of driving on the left continued throughout the UK, Scotland and England have promoted Ado with flying colors unfortunately taken a single crossing against traffic with a lot of swearing in English did slip the score with praise! We could not miss the exciting homecoming "bison". For the uninitiated, the legendary motorcycle Tiger Explorer XC has earned this name in the field of art. And when Hinckley, in England, Ado was presented with his faithful traveling companion to the headquarters of Triumph the trepidation of the moment was so great. While two mechanics have devoted their attention to the bike for a complete check, the young Cuneo has been able to enjoy a private tour with a lot of personal guide inside the establishment, 500 employees (of which 200 involved in the design) dedicated to the assembly of the various models, with a job that starts the engine but who wants to keep alive the creativity of employees; for this reason it is not structured, and structured on the assembly line, because claim that "the details are art, and art is not factory in chains of production." Just as Ado was the headquarters was "boxed" the bike number 615,000, a Daytona. The confirmation of the visit at the "Castrol Technology Centre" (one of the sponsors) has characterized the transition to Pangbourne, always in England, "a concentrate of technology almost sci-fi, where takes place at the heart of research on lubricants dedicated to the bike. " And then, kilometer after kilometer, Amsterdam with an invitation to stop at the European headquarters of the ' ARAI - Official partner of the trip - which Ado is particularly fond of, as Arai was the first major brand to believe in his project. New strong emotion with a visit to '"Arai Inspiration Centre", which houses more than 500 helmets returned from large MotoGP and SBK riders with a lot of autograph attached. For more information: Nadia Dotta 0172/646327; info@nadiadotta.com . There are now six weeks Ado toured Europe on the bike: Portugal, Spain, Ireland ... Where were we last Friday? Ah yes, in the UK, specifically in the beautiful city of London, the fourth leg of the journey between the capitals of Europe. 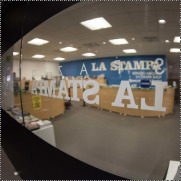 A few months ago, during my visit at the headquarters of La Stampa, made ​​possible thanks to CareerBuilder Anam (http://lavoratorioanam.wordpress.com/), I did not believe anymore that my adventure would have ended up on their pages. 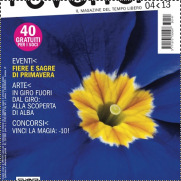 But thanks to Kairos Events (http://www.kairoseventi.it/) who have collaborated for years with all the major newspapers of the Cuneo and not, who have managed to bring to the attention of the newspaper Torineese my adventure, has been possible the publication. Thank you very much. Here we are at the end of the third week of travel Ado! How did it go? What places have you visited? Last week we left Ado on the road to Santiago de Compostela, which has reached and visited in the rain last Thursday. Here he met the martial arts champion Spaniard Jose Cardalda who offered him hospitality for the night, and also of Italian tourists: you have never seen the shadow of at least 2.000km. 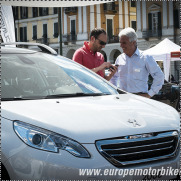 Twenty-five thousand kilometers in four months, starting from Cuneo: Good road, Ado! The trip includes a long journey and embraces the ambitious idea to reach all the major centers of Europe: 25,000 km in four months, which could become nearly 30,000 according to the different routes that will be identified. The planned 27 European cities to visit in the meantime have become 28, as from 1 July also Croatia will join the European Union. The twenty-five has already covered much of the south of France, through Nice, the Gard region and Toulouse. The circuit is continued until Pamplona and Leon, then to Portugal and, in recent days, up to Zaragoza. Ado is broken at a time from the Spanish city of Pau and subsequently reached Poitiers. 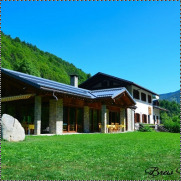 A detailed itinerary that winds still in France and will be updated in real time. There is a bolt out of place. The Adnan Maglajlic's Tiger Explorer XC is ready to go. Respecting its roadmap, the young Piedmont rider originating in Bosnia will start on Saturday 1st June for his tour of Europe: about 30,000 km to the discovery of the 27 capitals, to find out what unites and what divides a people so different in the uses and customs, but united in a single continent. "In fact, the capital will be 28," says Adnan, "because the next July 1, Croatia will officially join the European Union and I'll cross after this important event. I'll be the first rider to visit all the European capitals, from first to last." 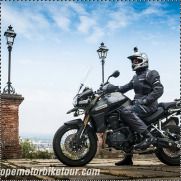 27 European capitals to reach about 25,000 km to be covered in four months on the saddle of the Triumph Tiger Explorer XC, raise awareness of the importance of blood donation are the objectives of Adnan Maglajlic, twenty-five boy born in Bosnia and Italian citizen for a few months. 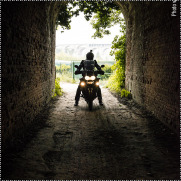 The trip begins when Adnan (Ado for friends) decides to ride a motorcycle in his native country; researching places to visit and ways to go come across the story of David Biga, monregalese that has been around the world on a motorcycle. Today from Cuneo, in Piazza Galimberti, the young Adnan Maglajlic will begin the trip to Europe sponsored by the City and Fidas, with the aim of informing the citizens of various countries on the importance of blood donation. The passion for the journey joins the social commitment through the International Federation of Blood Donor organizations will be achieved major associations at European level, to promote public awareness campaign on blood donation. My name is Adnan Maglajlic, Ado for friends, and I was born in Bosnia and June 5, 1987. I live in Italy since 1999 and I love this country, but I am very attached to my hometown that I had to leave after the war. For this in one winter day I decide to combine two passions and to return to my hometown in motorbike, 1,200 kilometers alone to my homeland. Immediately I decided to sell my naked and buy a motorbike more comfortable, the bike that I had seen at the EICMA, when just sitting down on I realized that it was the right bike for me (Triumph Tiger 800). I started my search on the internet for places to visit and along roads, until I come across in the story of David Biga. Njegova avantura na točkovima trajat će četiri mjeseca tokom kojih će preći 30.000 kilometara. Informatički tehničar iz Gračanice, koji od 1999. godine živi u talijanskom Cuneu, u razgovoru za portal Klix.ba kaže da se na ovo putovanje odlučio kako bi se oprostio od Evrope, pošto naredne dvije godine planira provesti u Australiji i na Novom Zelandu. A ukoliko mu se svidi život u ovim dalekim zemljama, namjerava tamo i ostati. Who has not dreamed of you to drop everything and leave for the world in search of adventure? Maybe in motorbike! There are those who you imagine only and those who fail to do so seriously, with a lot of sponsors and partnership in tow, calling the attention of the newspapers of the province and the motorcycle industry. Just have a good project, tenacity and chutzpah, as Adnan Maglajlic. 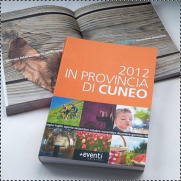 Founded in 1198, Cuneo takes its name from the shape of the plateau on which stands at the confluence of the stream with the Chalk River Stura, a triangle with a bit stuck in the middle of the plain and the other two open towards the mountains and the six beautiful valleys leading to France. It is the city of the seven sieges, untamed and rebellious, but also a living city, characterized by an atmosphere of welcome and hospitality. Hundreds of feet of porches, which make it a vast open-air mall, depart from Via Roma, the main street of the old town, to get to the wide and elegant Piazza Galimberti, the living room of the city that keeps alive the memory of the Resistance and the Gold Medal of the city that prides itself, and proceed to the modern geometry of the new city along the course Nice. On main roads bordering the portals of the oldest churches, the Town Hall and the houses of the old nobility, while the narrow streets hiding treasures such as the churches of Santa Clara and Santa Croce, Contrada Mondovi with the synagogue of the former Jewish ghetto , Teatro Toselli and medieval buildings dominated by the former church of San Francesco. From the roots of the ancient walls of the city have sprouted curtains of green that sink in the park around the city and extend the many avenues and gardens, the tree-lined streaked with light and shadows of the Avenue of Angels, making Cuneo the "Green Capital of Piedmont". To create beers of character, we transferring to our products the passion that drives all our projects. That 'our secret, our conception of craft beer and food research. We are inspired by the great brewing tradition in countries such as Belgium and the UK, to revise territorial styles and historical recipes, giving our beers a touch of fantasy and their personalities' well defined. Our beers are high-fermented, unfiltered and unpasteurized. 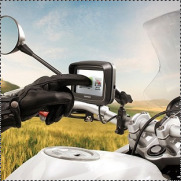 TomTom is a Dutch company that produces satellite navigation systems for cars, motorcycles, PDAs and smartphones. Thay are the leading supplier of navigation systems in Europe with offices around the world. Enjoy all the adrenaline and the curves of the road on your bike with "winding road"
Find routes online and upload to your device with the function "Load paths and go"
Preamble, I had never used Sixs products much less technical products for motorcyclists. I used techniques t-shirts of other brands, but for run / bike when it was cold (for motorbike I always used cotton t-shirts, that as soon as we stopped to eat I changed because they were sweaty and if I was one minute outdoors I took just a damn). And to be honest I was slightly skeptical that they did sweat. But here we are definitely telling another story, the day 14/04 (plenty of sunshine) I used the following products: TBX (neck), DBX (balaclava), Long S (socks), STX (full suit)... All under leather suit and helmet. The TBX (neck) is very well done, tight but elastic, so as you place it, it does't move. But I put it above the DBX (balaclava) so I covered the piece behind the hill was left uncovered (between the leather suit and balaclava). DBX (balaclava), I have not sweated like with silk, though I would have done slightly wider opening eyes, every time I took off the helmet and put again tended to "cover up" the side view (but nothing that settles with the hands without gloves, pushing it a litle in the back). Tracksuit (STX), unfortunately it is impossible to explain until you try it, I arrived at lunchtime to the sea and the first thing I did was to put my hand to feel the sweat on the skin, but there was no (the same test I did when I got home). Now someone will laugh, but after a day on bike I felt no smell of sweat on. Socks (Long S) are really high, I think I would rather try the short ones (Fant S) or medium (Short S), because these were going to finish over the suit (STX), and on the leg where there was the "double layer" the hairs were slightly damp (but I do not speak about sweat). Ah, when was arrived the pack at home, and when I saw it all in long sleeves, I thought that Sixs had not realized that my journey would take place in the summer ... But now I realized that I had better shut up and try it before criticize. What can I say, now I have the whole winter product to try ... Stay tunned in a few months when I will be near the North Cape. FIDAS is a federation of 73 associations of volunteer donors of blood. Care coordination at the national level and ensures a qualified contribution to any socio-political and human initiative, which commits the Italian voluntary blood. Participate, updates and informs about innovations in the legislative, scientific and health, affecting donors and the transfusion service. 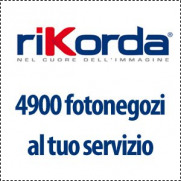 Rikorda, is a Italian leader in printing material. 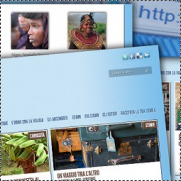 Specialists in printing photographs, photo calendars, cards, postcards, gadgets. In other words, all your printing needs is their job, both for individuals and entrepreneurs. FotoTaxi is certainly one of their most popular products, but important new features are coming soon. 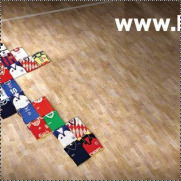 Important Italian company from Ravenna. With our clothing you travel with more comfort and better protection under any weather. 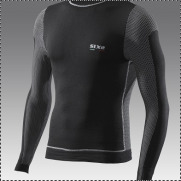 SIXS plo shirts and all Underwear garments, along with the new and revolutionary PRO Tech line, allow you to travel in any weather with the certainty of keeping your skin always dry, protecting you from heat, cold, temperature differences and shocks. No more need to change when stopping and no more unpleasant odours. CLS (Chain Lube Systems) - Innovative motorcycle acessories decided to support me in my adventure. There is some photos durning assembly of their products: heated grips and electronic oiler. Adnan (Ado fot his friends) is a cool guy. One of those who makes up her mind one thing and carries out, whatever the cost. The last that jumped to mind? Across Europe by motorcycle, covering about 30,000 km in four months. Born in 1987, computer technician, who was born in Bosnia and officially became an Italian citizen from a few days, Adnan Maglajlic will start on June 1 for his adventure on two wheels. Doubts? No one. 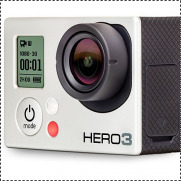 "With the camera Hero3, GoPro stands out from the competition again. This new sports GoPro camera is equipped with a TV-ready image quality without equal." "The new GoPro HD Hero3 is ideal for filming everything that makes the adrenaline and to make those extraordinary moments live forever." "... More powerful than the most professional cameras on the market today." 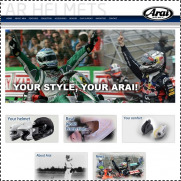 Arai was the first major brand to believe in my project by sponsoring one of their helmets "Tour-X4" of the new 2013 collection (Model: Explore Silver). Adventure, grand touring or off road, no matter the riding conditions, the Tour-X4 is ready for anything. The Tour-X4 has a complete new outer shell. Redesigned to be tougher, stronger and stiffer than ever. As the Tour-X4 may be used under extreme conditions, the ventilation system has been redeveloped for maximum efficiency. The new Facial Contour System (FCS) offers more support and comfort to the lower jaw and creates a tighter fit. For an even better personal fit, there is a removable 5 mm surface foam layer on the cheek pads and temple pad from the headliner. Wear the Tour-X4 with or without peak, with or without visor and combinations of these two. The large visor opening offers plenty of room for motocross-style goggles when riding without visor. Copyright © 2013 Europe Motorbike Tour. All rights reserved.